MAPS suite also has orthographic component come in the four modules shown below, some of which are being developed, however, output samples are available for download as PDF for your convenience, you are also encouraged to send us your sample input for processing free of charge, we accept limited size samples in any form or encoding. Arabic is a non-concatinative language, it can be described as derivational language meaning that the morphotactics depend rather on affixation i.e. adding morphemes onto the word without changing the root, that is, preserving the core order of the verb binyanim, this results in the highly regular inflectional pattern distinguishing the language. Kalmasoft Arabic Verb Conjugator is a production full-form derivational tool built on a root-based algorithm; a root like [ksr] "to break" may be seeded into the module to yield roughly 30,000 conjugations which is the thorough listing of the verb paradigm but after applying specific orthographic rules, this is theoretically true for any other triconsonantal sound root. Kalmasoft also offers the algorithm and/or the list of tagged roots which can then be seeded into the system to create the whole inflectional paradigm of the language back again or just the conjugation table of a specific form of a verb; binary scripts are available and can be obtained too. Since Arabic has no infinitive form for verbs, current conjugators are limited to the third person masculine singular past tense form which serves as the "dictionary form" used to identify a verb, similar to the infinitive in English, this basic form has no practical or pedagogical use for advanced learners. Our conjugator goes beyond this elementary output and generates the "real world" derivational candidates found in texts that used by native speakers as shown in the sample below. 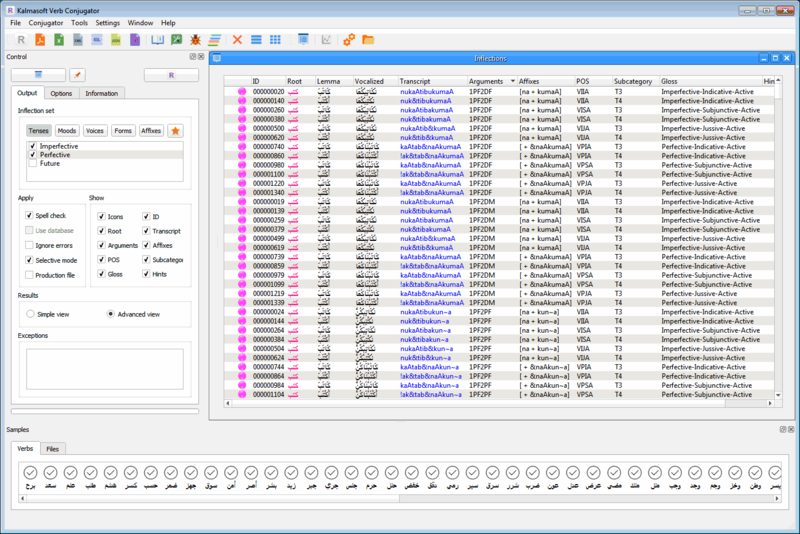 A screenshot of the MAPSOrtho Conjugator interface, you can view the technical specifications. You may also DOWNLOAD Evaluation copy. The sample given below contains multilingual text. Without proper rendering support, you may see question marks, boxes, or other symbols instead of the correct intended characters, you may download the suitable fonts from our lingual support page.